The new Ford Grand C-MAX Estate is the bigger, seven-seater version of the standard C-MAX. It’s priced a bit higher but costs £3,500 less than the even bigger S MAX. It’s practical, fun to drive and boasts a range of punchy and economical engines. Stylistically, it’s not the most eye-catching car in the world, but there’s more quality inside than last time and it has the potential to be a solid mainstream alternative to premium models. Ford has a long history in car manufacture, read more about it in our brief history of Ford. OSV takes a closer look at what it’s all about with our 2018 Ford Grand C-MAX Estate review. It might be bigger than the C-MAX, but this Grand variant is still fun to drive. Its steering is just great – it’s agile, more responsive than last time and accurate, and the car feels at home in the towns and cities, as well as in the countryside and on the motorway. In fact, take it out into the countryside and it drives a lot like the much smaller Fiesta. Body roll is minimal and there’s plenty of feel so that you know exactly what’s going on. All in all, no other car in this market can rival the Grand C-MAX Estate for pure driver enjoyment. In terms of its engines, you might raise an eyebrow at how small the EcoBoost petrol engines are, but don’t let this put you off. They’re lively and quick, and they also have a decent amount of mid-range punch. These engines excel in the towns and cities, and they make perfect sense for lower mileage drivers. For example, if the school run is one of your main chores, you can’t go wrong with them. That said, the 1.0-litre 99bhp variant is probably going to be too small for most buyers. It’s also slow and covers the 0-62 dash in 13.6 seconds. The 123bhp 1.0-litre is a better choice. It has just about enough power to cope with the car on a full load and can get you from a standstill to 62mph in 12.2 seconds. One of the main reasons you might buy this over the standard C-MAX is its high driving position. It ensures fantastic visibility – at least up front. A dash-mounted gear shift further highlights its practical credentials, but its actual layout is near identical to the standard C-MAX. However, there’s a difference in terms of out and out quality, with this Grand model benefiting from better materials – the kind you’d usually find in a Volkswagen. Comfort is excellent, as is insulation. On the move, engine, road and wind noise are barely perceptible and the cabin feels genuinely cosy. The supportive seats are nicely cushioned, and because ride quality is good, the car makes for a fine motorway cruiser. Is the Ford Grand C-MAX Estate practical? It’s got seven seats, which already gives it a clear advantage over the five-seater C-MAX, but the best thing is that even adults can sit in the extra third row of seats – something that can’t be said of many cars in this class. The 2+3+2 seating configuration is super flexible, with the three individual seats in the back splitting 40/20/40. If you specify the Comfort System, you can enhance practicality even more. The centre seat can be folded away, while outer seats can be slid backwards for extra legroom in what becomes a 2+2 configuration. Head and legroom is good, while the boot measures an impressive 432-litres with all the seats up. Fold all the rear seats and it increases to 1,723-litres. Are Fords reliable? Read our honest assessment of Ford reliability. There are only two trims available, which keeps things nice and simple. The Zetec trim is now the entry-level model, and it comes with rear parking sensors, voice control, Bluetooth, a digital radio, a leather steering wheel, air conditioning and alloys. The Titanium model adds tyre pressure monitors, power-folding mirrors, a navigation system, cruise control, keyless start, hill launch assist, an auto-dimming rearview mirror, twin electronic auto climate control and auto headlamps. An optional extra pack that we recommend is the Convenience Pack, which comes with Active Park Assist. Parking a large car like the Grand C-MAX can be tricky, and this system takes away some of the stress. In terms of how safe the car is, it’s massively disappointing that it scored only 3/5 when it was crash tested by Euro NCAP. 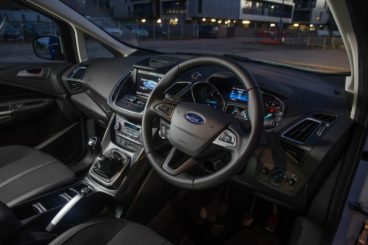 Ford have added plenty of advanced safety tech to boost its credentials, but the likes of Corner Brake Control, Blind Spot Information System, Active Park Assist and Traction Control System aren’t available with the Zetec model. In terms of its running costs, the EcoBoost engines are strong and efficient. The 1.0-litre 100 and 125 engines both manage 54.3mpg on a good day, and they both emit just 118g/km of CO2. These are good numbers for such a big car. That said, it’s hard to imagine that you’ll be achieving 54.3mpg on a regular basis, and the petrol engines are only recommended if you’re a low mileage driver. Insurance-wise, the engines range from group 13 to 19. In typical Ford fashion, the Grand C-MAX – despite being one of their biggest cars – is entertaining to drive. You’ll love the flexible seating arrangement. It’s fab for families especially. And seven spacious seats at that. There are just two engines and two trims available. That said, the engines are both strong and affordable, while both trims are well kitted out. There’s room back there – but only for kids. 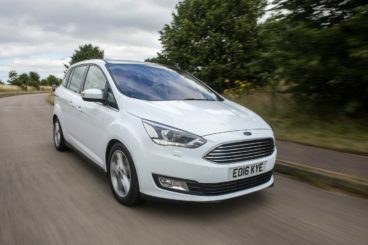 Let’s see how the car fares against its rivals in the comparison section of our 2018 Ford Grand C-MAX Estate review. 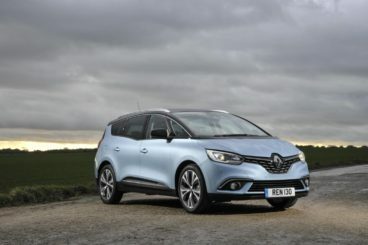 The new Renault Grand Scenic is striking to look at, affordable to run and very practical. The Ford C-MAX edges the Renault in terms of pure driver enjoyment, but this is still a genuinely good car to drive. It’s competent enough and feels well-planted. There are one or two deficiencies. Body lean is noticeable if you enter corners with too much enthusiasm, and it’s odd that the smallest alloys are a massive 20 inches. They look great but unfortunately, they don’t do much for ride quality. On rougher roads, the car will feel jerky. In terms of the engines, there’s just one petrol available. It’s a turbocharged 1.3-litre unit that develops either 113 or 138bhp, and it’s brand new for 2018. Sharp-eyed Grand Scenic fans will have noticed that it’s taken the place of the 1.2-litre petrol, and it brings more urgency to the table. A 0-62 time of 10.3 seconds for the 138bhp is impressive, while the smaller 113bhp model completes the same sprint in 11.8 seconds. Running costs? Both petrols are able to return 50.4mpg, which is surprising when you consider their differences in power. They both emit 125g/km of CO2, too, and have the same BiK rating of 24%. Inside, the Grand Scenic is well-equipped, with even the entry-level models getting a leather steering wheel and a digital radio. The Dynamique Nav model adds black ambient lighting, and it’s seriously upmarket stuff. Overall, the cabin is smart, tasteful and a pleasant place to spend your time on the road. Is the Renault Grand Scenic Diesel practical? It comes with seven seats and a second row that slides forward with ease to boost legroom for those in the third row. The third row, meanwhile, can be folded into the boot to increase load capacity. Space, on the whole, isn’t bad but could probably be a bit better, and getting into the rear seats can be a bit of a chore. However, it’s well worth mentioning the one-touch seat-folding system. The boot is reasonably sized and measures 596-litres when you fold the third row of seats. The new Citroen Grand C4 Picasso is stylish, comfortable and practical. It’s not as engaging to drive as the Ford, with Citroen putting the focus much more on comfort. That said, it’s still a good car to drive that isn’t going to pose you any significant problems. There are one or two criticisms. For example, while the soft suspension ensures good ride quality, it also means that body roll is a bit of an issue in bends. Still, there’s plenty of grip on offer, and for the most part, the car feels secure. 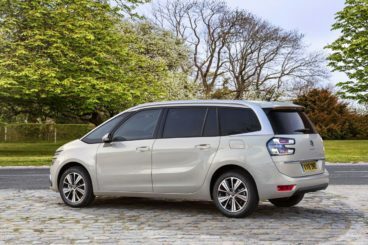 In terms of its engines, petrols aren’t all that popular with cars like this, but the sole petrol engine on offer with the Grand C4 Picasso is more-than-capable. It’s a turbocharged, three-pot 1.2-litre engine that develops 128bhp. That’s enough to cover the 0-62 dash in 10.8 seconds, and this figure doesn’t change if you specify the 6-speed manual gearbox of the automatic. It’s quiet and smooth and generally more relaxing than the diesels. Running costs? The diesels are significantly cheaper to run, but we still think that returns of 56.5mpg from the petrol engine, when paired up with the manual gearbox, is acceptable. The car has a BiK rating of 22% but its emissions will increase if you choose bigger alloys. Inside, we can’t fault the way the cabin is designed one bit – it’s impeccable. Large windows flood the place with lots of light, visibility is second to none in this class, and the height adjustable driver’s seat and rake adjustable steering wheel make it easy to find the right driving position. Diesel models can get a bit noisy, but this isn’t something the petrol model has to contend with. The dashboard sports a very space-age look, but while it looks fab the controls can be a bit awkward to use. You’ll soon get up to speed, however. Is the Citroen Grand C4 Picasso practical? The car was made for family life on the road. It has seven seats, plenty of storage solutions and a fairly big boot. This boot measures 165-litres with all the seats up, which admittedly sounds small. Fold the third row, however, and it extends to 632-litres. Fold the second row too, and it extends to as much as 2,181-litres. Even better, its boot is flat and there’s no load lip. Other than that, the back seats recline and slide forward, the outer seats in the middle row fold away – but there are no sliding rear doors. Finally, a seven-seater C-MAX. But is it any good? Ford reckon it’s going to outsell the C-MAX, and it’s easy to see why. It’s super practical, comfortable and boasts a very versatile seating arrangement. The Ford Grand C-MAX Estate even drives well, and if you need seven seats and really like the Ford brand, you can’t really go wrong with this one.